Western Australian surfers are getting excited about a rare super swell event for Perth and the South West this weekend, fuelled by powerful Tropical Cyclone Marcus. North westerly swells and offshore winds are expected to create the perfect surfing conditions, with Sunday looking like the day to watch. Marcus, a category five system, is currently generating wind gusts up to 285 kilometres per hour in waters, and is sitting about 1,000 kilometres north west of Exmouth. The system is expected to be downgraded as it moves further south over the coming days, but wind waves generated by the cyclone are forecast to barrel down the west coast. The last time a cyclone brought north westerly swell to the region was in 2011, when Tropical Cyclone Bianca cut a similar path to the one Marcus is expected to take. Early forecasts for Margaret River and Yallingup show up to 3 metre north westerly swells coming through about 2pm on Saturday, and sticking around all day on Sunday before becoming south-westerly. 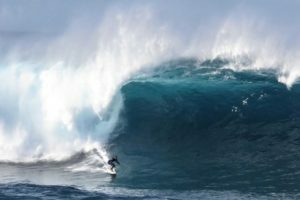 Surfing WA chief executive Mark Lane said a north-westerly or north north-westerly swell creates a range of exciting surfing opportunities along the state’s South West coast. Mr Lane said a lot of beaches that are normally protected from the usual south westerly swell will have waves coming straight in. “And a lot of reef formations that rarely see waves break on them, all of a sudden light up,” Mr Lane said. He said for surfers to take advantage of the change in conditions, they will need to keep a close eye on the swell and look at their maps. “You’ve just got to go back to the old-fashioned way of doing your surf check,” he said. Mr Lane said if the forecasts are correct, surfers will have an exciting couple of days. “If it does come, it will be a weekend for adventure,” Mr Lane said. But Mr Lane urged surfers to be on the ball, saying cyclone swells were very short-lived. “So they last for maybe a day and a bit and they go as quick as they come,” Mr Lane said. For those people unable to make it to the South West this weekend, conditions around Perth and Rottnest are also looking good at this stage. The Bureau of Meteorology’s Pete Clegg said Perth was set to get north-westerly swells on Sunday of around 1.5 metres. “And at Rottnest, we’ll probably see it peaking around 2 metres,” Mr Clegg said.